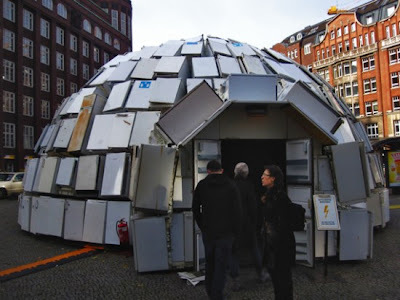 German artist Ralf Schmerberg has created a bizarre-looking igloo, in the middle of Hamburg, to send a message about the country’s uncontrolled waste of energy. 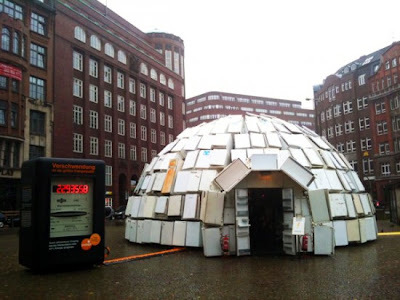 Entitled “Wastefulness is the biggest source of Energy”, Schemerberg’s igloo aims to raise awareness to the amount of energy people are wasting nowadays. A huge electrical meter set up outside the igloo shows passers-by how much electrical energy the 322 old fridges would consume, and is meant to inspire them to think carefully about how much energy they are wasting every day. According to recent studies, Germany could save up to 40% of its energy, if everyday people would use electricity more efficiently. 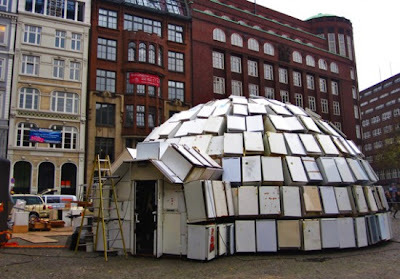 The refrigerator igloo was sponsored by a German energy provider and will be exhibited in Hamburg’s Gänsemarkt until November 9th. The bizarre installation is 5.6 meters high and 11 meters in diameter, and was built using 322 old refrigerators and 1,718 meters of wire. On the inside, visitors can admire a funny electrical installations made up of colorful blinking lights.